“Then put your little hand in mine...” The relentlessly repetitive digital clock radio that woke up Bill Murray's cursed weatherman character in the film Groundhog Day may have been the most annoying alarm clock EVAR, but this selection of 10 shocking sleepers' surprisers from Japan would give it a run for its money any day, every day. Sweet dreams... your worst nightmare lies in wait! Talk about killing with kindness! 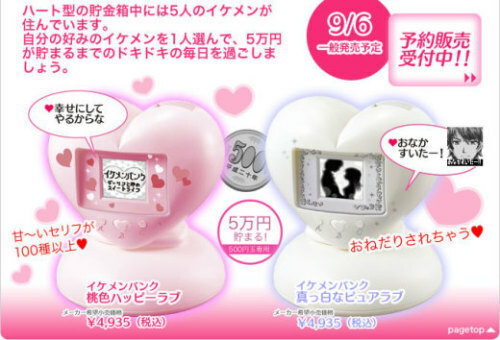 The Handsome Man Bank (known in Japanese as the Ikemen Bank) will gently wake you, whisper sweet nothings in your ear, and leave you penniless. Basically, it's a man without the mess. Here's the perfect gift for all you armchair MacGrubers out there. 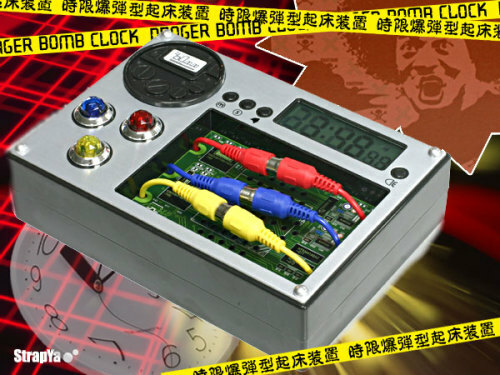 The DangerBomb Alarm Clock (just 2,534 yen or $30.50 at Rakuten) “goes off” three minutes before your preset wake time when an ominous voice begins a countdown to doom, instantly chasing the remnants of your dream date with (insert name of supermodel/actress/singer here) from your dazed, confused and panic-filled mind. 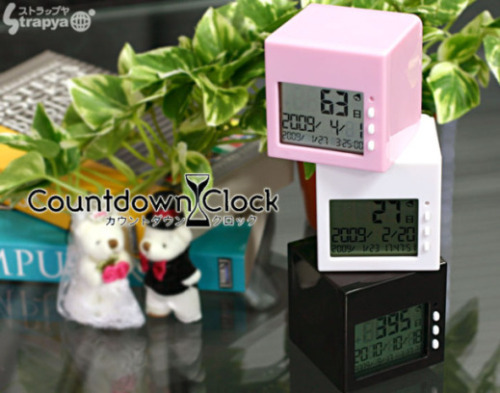 The Countdown Alarm Clock offers sleepers a different way of looking at time, in which every appointed hour is Zero Hour. 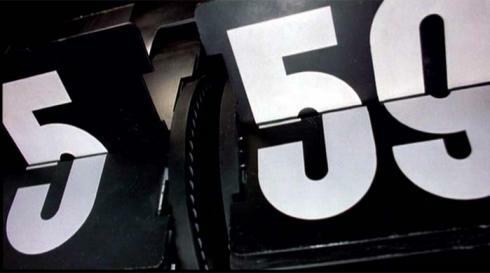 Ideal for fans of the dramatic, this diabolical little 2x2x2” cube methodically counts down to any designated wake-up time up to 9,999 days away – that's 27 years for you Rip van Winkle types. 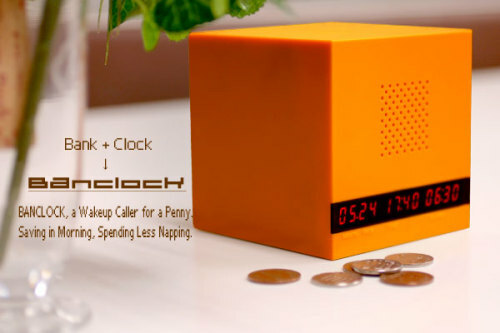 Like the Handsome Man Alarm Clock, the Banclock Bank + Alarm Clock demands coins to function properly. Unlike that plastic purveyor of flattering compliments, however, your coins are necessary to shut it up. No cash on hand? Then prepare to endure 5 minutes of electronic beeping until you either pay up or, as the expression goes, break the bank. 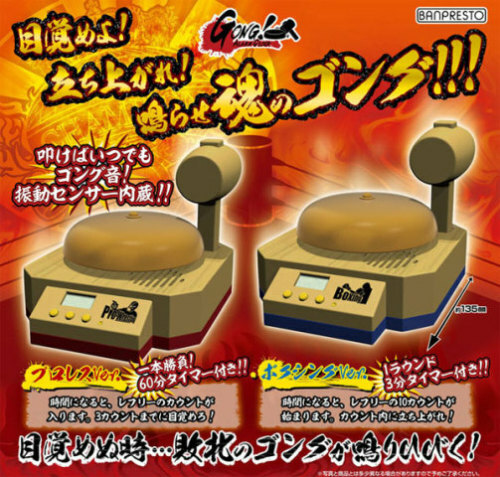 The Banclock Bank + Alarm Clock costs 5,480 yen (around $65) and buyers should ensure they've not spent every hard-earned cent on their purchase – you'll want to have plenty of loose yen lying around to feed the beast when it gets money-hungry. You can get the Banclock in the US here. Wee paws for station identification? Step right up and welcome to the cuteness that is the Singing Dog Alarm Clock! 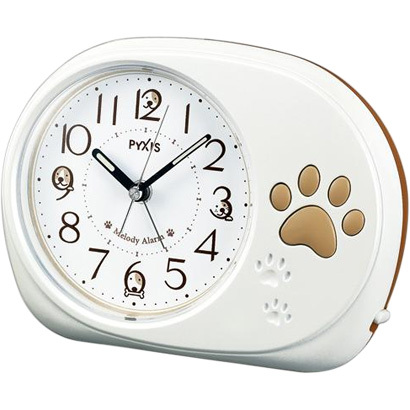 This is no mere novelty clock as it's made by Seiko (though it displays the brand name Pyxis) and presumably won't break the first time it awakens you to the cheery sound of Glenn Miller's classic "Little Brown Jug" – accompanied by a barking dog. YOU might break IT like, with your fist, but be aware such “ruff” treatment probably isn't covered under the warranty. Let's get ready to... well, whatever you were planning on doing this morning! You may not be lucky enough to have a genuine Ring Girl traipse across your bedroom but the Gong! Alarm Clock is the next best thing... well, not really, but one can dream. 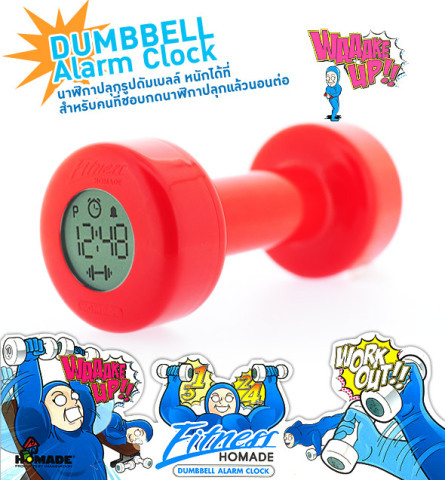 The Dumbbell Alarm Clock is... an alarm clock in the shape of a dumbbell. That was easy – waking up to it, not so much. 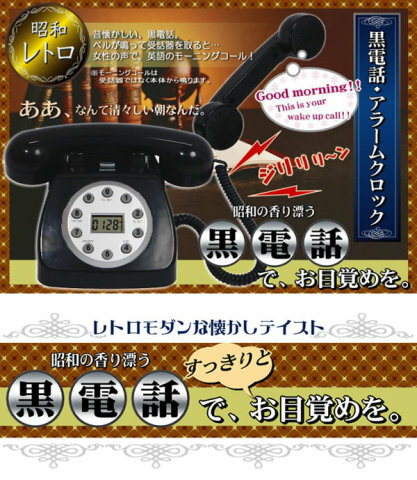 You see, like many Japanese alarm clocks, this one doesn't merely ring to wake you up, it gets you working while your semi-dozing carcass is still flat on its back beneath the covers. Goodbye golden slumbers, hello pumping iron! 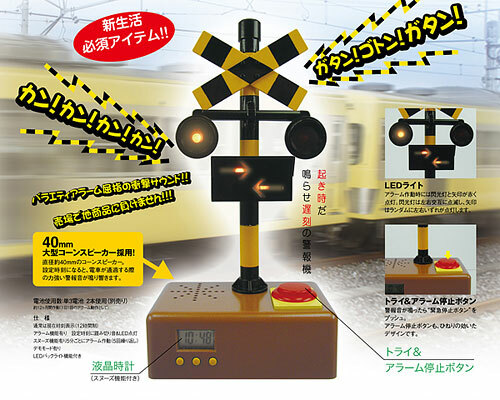 Whoever thought up the Railroad Crossing Alarm Clock has got to have a mean streak as long as the Silver Streak. No peaceful, soothing awakenings for the owner of this demonic device, especially if they happen to be dreaming of driving when a chorus of ringing bells and flashing lights startles them back to reality. “The dream police, they live inside of my head...” and if this particular Cheap Trick's on your holiday gift list then be sure not to blow the required 2,900 yen (about $35) on coffee and donuts. 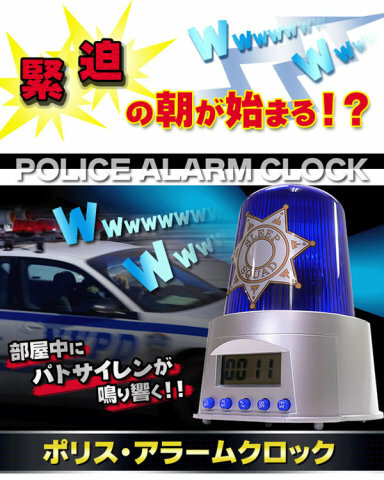 The Police Alarm Clock has “Sleep Squad” emblazoned across a big blue flashing light suitable for a patrol car, and you'll be wishing it still WAS on a patrol car each and every morning. If you don't see something arresting here, check out 11 Alarm Clocks To Wake The Living Dead.